A Soyuz rocket carrying Russia's Kanopus-ST spacecraft and another military satellite blasts off from Plesetsk cosmodrome on Dec. 5, 2015. Kanopus-ST is an experimental spacecraft likely designed to test the ability to track enemy submarines, according to RussianSpaceWeb.com, a site run by historian and journalist Anatoly Zak, a leading expert on Russia's space program. "Although the previously quoted resolution of instruments onboard Kanopus-ST seems to be too low to discern submarines or their wake, the satellite could be a precursor for more advanced high-resolution systems," Zak wrote. "The alleged anti-submarine capability apparently led to the classification of the Kanopus-ST as a military payload," he added. "Further public information on the status of the project and its instruments was largely restricted." Tracking data gathered by the North American Aerospace Defense Command (NORAD), a joint effort of the United States and Canada, have revealed that the Soyuz's Volga upper stage (with Kanopus-ST still attached) had maneuvered to an orbit whose closet point to Earth lies at an altitude of just 65 miles (104 kilometers), Zak wrote. "The lower portion of this elliptical path would take the satellite into a much denser upper atmosphere, causing very quick decay of the orbit and a fiery demise of the spacecraft," he wrote. "The maneuver could've been programmed into the flight assignment of the Volga upper stage before launch in order to reduce space junk after the delivery of the satellite." NORAD data suggest that Kanopus-ST could fall back to Earth as early as Tuesday (Dec. 8), probably in the Southern Hemisphere, Zak wrote. 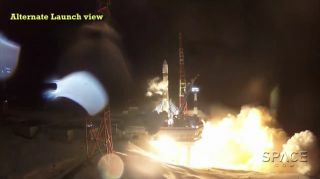 The Soyuz that blasted off Saturday also carried another military spacecraft, which Zak identified as "the KYuA-1 radar calibration sphere, which was to be used for radar tests by the Almaz-Antey company, the developer of anti-aircraft and anti-missile systems." This second satellite is apparently performing normally in its intended orbit, according to Russian media reports. With NASA encouragement and funding, the American spaceflight companies SpaceX and Boeing have been developing their own crew transporation systems to low Earth orbit. NASA hopes that these homegrown systems will be up and running by 2017.